These two lifejacket lights from United Moulders are identical in appearance and price: the difference is that one offers a long flash while the UML SeaFlash Multi offers a range of options – long flash (default), fixed, or Morse code ‘SOS’. The fixed light was easiest to pick out, but didn’t attract our attention like a flashing light– so for that reason we found the long flash was easiest to identify. It was equally as bright and visible as the AQ40L, and could be seen over the same angle range (about 270°). It has a clear rather than the ‘smoked’ plastic dome. Its battery is inside the sealed light unit, with the water-activated switch at the end of a wire. An oral inflation tube bracket is available, but ours came with a saddle clip to attach to a webbing strap of your lifejacket. 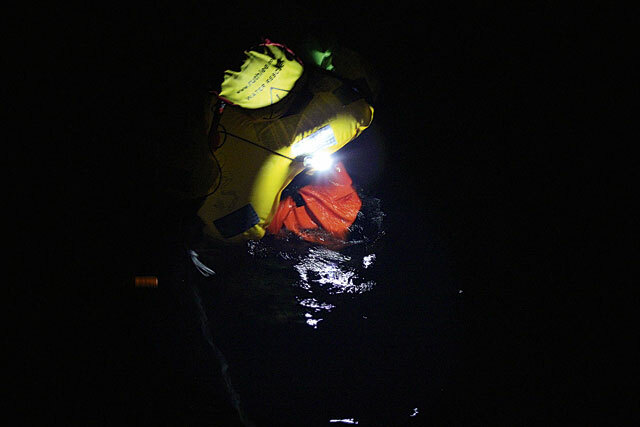 Conclusion: We liked the ability to switch to a fixed or SOS light on the SeaFlash Multi, which would allow a casualty to illuminate themselves or signal to their rescuers. Its long flash and bright light made it easy to pick out.